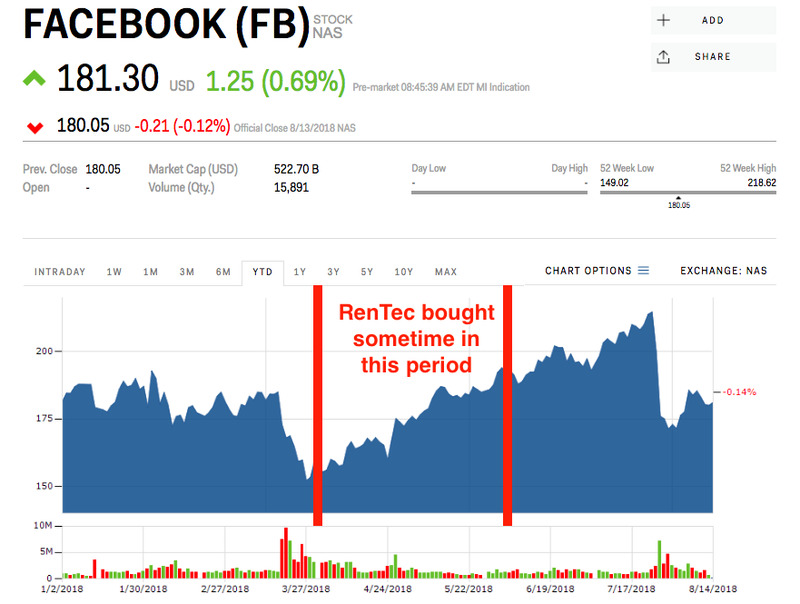 Renaissance Technologies, a quant hedge fund that oversees $US84 billion, bought up $US479.5 million worth of Facebook between April 1 and June 30, regulatory filings show. The hedge fund was apparently “buying the dip” after the social network’s scandal-ridden spring caused shares to plunge by 20% at the end of March. Watch Facebook trade in real time here. Renaissance Technologies, the $US80 billion hedge fund founded by Cold War code breaker James Simons, seems to think the worst for Facebook is over. The hedge fund snapped up 2.47 million shares of the stock in the second quarter – at a valuation of $US479.5 million – according to regulatory documents filed Tuesday. A back of the envelope calculation shows the stake was established at an average price of $US194.13. Facebook has been one of the market’s top performing stocks in recent months, coming off the Cambridge Analytica data-privacy scandal. The stock rose 26% in the second quarter after tumbling 20% when the scandal first broke in late March. Renaissance likely saw the brief lapse in stock price as a chance to “buy the dip” in the wake of the carnage at the end of the first quarter. That strategy has been wildly popular throughout the nine-year bull market. It’s possible Renaissance exited its position at some point during the first half of the third quarter. If it hasn’t, it is likely underwater on the trade as shares are now near $US180 apiece. Other new investments disclosed in the filing include a $US706.9 million stake in Apple, a $US191.3 million stake in Microsoft, and a 40% increase in its VMware holdings – now worth $US777.4 million.